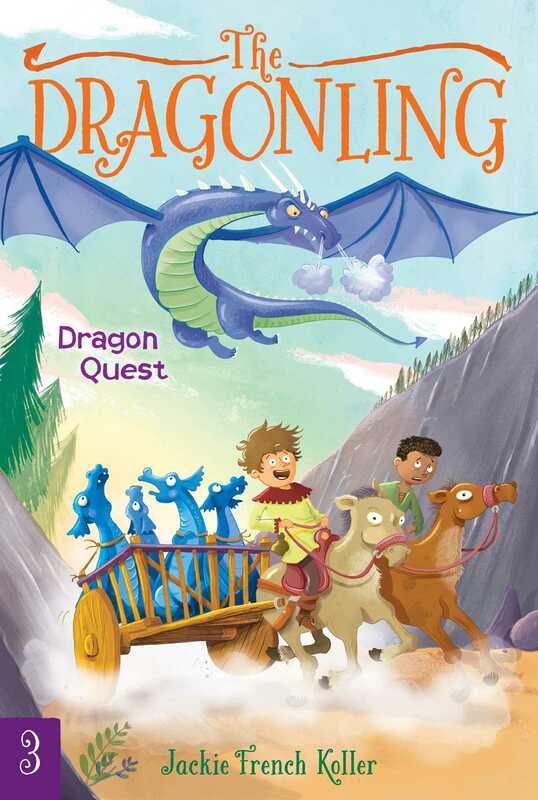 Darek and Zantor work together to stop the kidnapping of another baby dragon in this third book in the fantastical Dragonling chapter book series! Now that the villagers have finally accepted Darek’s dragonling, Zantor, they’ve all fallen in love with him. Especially Rowena, the spoiled daughter of the Chief Elder—so much so that she wants the dragonling for her very own. But Darek can’t give him up! He and Zantor are so close that he can almost get inside the little dragon’s mind. So the Chief Elder orders Darek’s father to find another dragonling. Even though a dragon mother will have to die—along with some villagers, too. Darek can’t let that happen. But how can he stop them…unless he joins the dragon quest? DAREK POINTED A STICK TOWARD the sky. He swung it in two wide circles, then slowly lowered it until its point touched the ground. Above his head Zantor soared, following the pattern Darek had traced in the air. The dragonling circled once, then twice over the paddock. Then he swooped down for a landing. The little dragon barreled across the field in his funny, lopsided gait. Joyfully he hurled himself at Darek, knocking him backward into the dirt. Darek squirmed with laughter as Zantor covered his face with kisses. Thwip! Thwip! The forked tongue tickled! Darek pulled a sugar cube from his pocket and tossed it a few feet away. The dragon scuffled after it, and Darek got to his feet and dusted himself off. Pola was laughing, but he wasn’t the only one, Darek realized. He turned and saw that he, Pola, and Zantor had an audience. A group of village children were hanging over the paddock fence. “Zantor! Zantor, come here!” they cried, reaching out eager hands. When Zantor waddled over to play, the children shrieked with delight. “Let me pet him first!” one cried out. “No, me! No, me!” the others shouted. Darek frowned. He was pleased, of course, that the villagers had finally accepted Zantor. For a time it had seemed that they wouldn’t even let him live. But Zantor had proven to all that he was both peaceful and courageous, and now they were willing to let him live among them. In fact, Zantor had become so popular lately that Darek seemed to be forever fighting for the dragonling’s attention. Darek was the one who had found Zantor, after all, and brought him to the village. Why should he have to share him now with people who hadn’t even wanted him at first? It didn’t seem fair. Darek looked where Pola had nodded. A taller girl had joined the other children. Her long dark hair fell over her shoulders as she reached out and scratched the horn nubs on Zantor’s head. Zantor buried his face in the girl’s shining hair and thrummed happily. Darek’s frown deepened. “Rowena,” he said with a groan. “She’s awful pretty,” Pola teased. Jackie French Koller has been a storyteller since the sixth grade, when she amused her friends by spinning tales on the playground. She has also edited a children’s newspaper, taught writing in public schools, and studied art. Ms. Koller lives in Groton, Massachusetts, with her husband.